This stadium and the Shaw Sports Turf playing surface will be a point of pride for the Satsuma community, indicating a new, progressive era for school system. 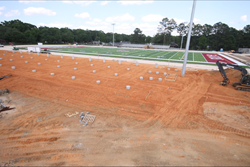 A camera attached to a pole on the tennis courts has allowed community members to keep track of the progress on the new sports stadium at Satsuma High School, including the installation of a synthetic playing surface by Shaw Sports Turf. A time-lapse photograph was taken every 30 minutes and added to the Shaw Sports Turf TV channel at shawsportssurf.com. This week marks the final touches on the installation of Shaw Sport Turf’s Momentum system. Fast, dense and firm, Momentum is a high-performance synthetic turf system designed with a proven slit film technology. In addition to its durability and performance benefits, Momentum’s fiber construction results in an umbrella effect that helps hold infill and reduce overall fly-out. “This stadium and the Shaw Sports Turf playing surface will be a point of pride for the Satsuma community, indicating a new, progressive era for school system,” said Steve Cochran, Satsuma High School Assistant Principal and Athletic Director. The old stadium was constructed by community volunteers, students and staff from 1958 to 1960. The Satsuma City School System was formed as an independent school district in 2012, with 2012-2013 being the first academic year. Cochran said he decided to utilize synthetic turf on the new playing surface because changing the field from an east-west orientation to a north-south orientation and adding a track resulted in the loss of practice field space. With Shaw Sports Turf’s Momentum surface, the field will have the durability to be used not just for games but for football practice, soccer practice and marching band practice as well. Satsuma High School will also hold graduation ceremonies on the playing surface. Construction began in November 2015 and is anticipated to be complete by August 1, 2016. After a dedication ceremony early in the month, the first competition on the field will be a home football game on August 19, 2016. First Team Construction, based in Auburn, is handling construction. To watch the slideshow of Satsuma High School’s Shaw Sports Turf installation from start to finish, visit ShawSportsTurf.com.